Texas home foreclosed on and evicted? Your stuff goes to curb! | Law Office of J. Thomas Black, P.C. In Texas, there are many different ways that your home can be foreclosed upon. These include your mortgage company, taxes, and unapid HOA fees. If your home is "posted" or set for foreclosure in the Houston, Texas area by your mortgage company, and you want to keep it, do something before the foreclosure sale. If you qualify for chapter 13 bankruptcy and there is no other way to save the house, consult with us or another bankruptcy attorney and file chapter 13 to stop the foreclosure sale and give you a chance to catch up the payments. Because if you wait too long, and the foreclosure takes place, it is likely too late to do anything about a foreclosure by a mortgage company. In Texas, they are final. Following a foreclosure, you will likely be given a "3-day notice to vacate." If you still don't move, and don't arrange for more time to move, the new owner of the property may file an eviction suit with your local Justice Court. If the J.P. determines that it was a valid foreclosure, he or she will likely issue a "writ of possession" ordering a constable or sheriff to put you out. Once that happens, I highly recommend that you move. If you don't move after a writ of possession is issued, the sheriff or constable will likely put you out of the house, and stack all of your personal belongings on the curb. Previously, the deputy constables used to have moving and storage companies accompany them when they did an eviction, and they would pack up the belongings and put them in storage. Then it would cost you thousand's of dollars to get them out, but at least they wouldn't be stacked all over the sidewalk. How embarrassing! Not any more. 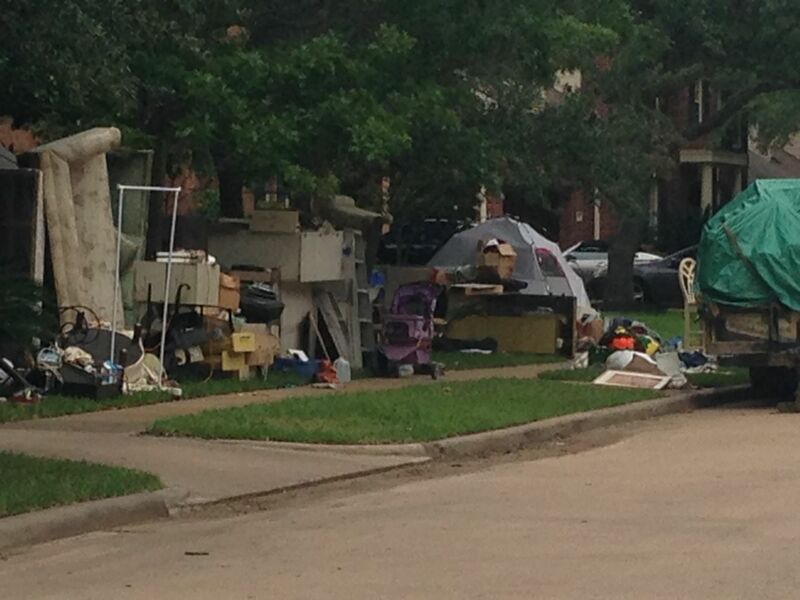 At least here in the Houston area, if you don't move after you are evicted, they just stack all of your personal items out next to the street. The photo above shows what this can look like, after it happened to some people in the tony Cinco Ranch neighborhood in Katy, Texas. It is a total mess. And if it rains before you can make arrangements to move your stuff, all of your personal property can just be ruined, and cost a lot of money to replace. Don't let it come to this. If your home is posted for foreclosure, consult with us or other competent legal counsel to determine what your rights are. Call us anytime at 713-772-8037 or toll free 1-877-597-9358 and make an appointment to come see us. Your first consultation with us is free. Or if you are not ready for an appointment yet, request free information, or see the free offers available on this website.